I’ve got a double-shot headed your way with my guest bloggers today—Anne Dayton and May Vanderbilt, co-authors of the books EMILY EVER AFTER and CONSIDER LILY! Lily Traywick thinks she must have been adopted. It’s easier than believing she’s actually related to Joan and Roland Traywick, her power-couple parents who run Traywick’s of San Francisco, the most chi-chi department store on the west coast. While her parents party with Miuccia in Milan and Gabbanna in Paris, Lily hangs out at home in ratty jeans and an old t-shirt. She loves softball, guys, and Jesus, and she’s eager to make her own way in the world. Feeling that her life is on hold, she turns to her best friend Reagan, a fashionista who has it all, for a major life makeover. Lily is soon dressing in the latest must-have fashions and pursuing a writing career. She’s even dating the perfect guy. But does he love her for who she really is?And what about his friend from college, reappeared in his life? As Lily’s friends question her new way of life, everything is getting more complicated. Public scandal, family drama, and technological disasters add to her confusion, and Lily is forced to consider whether her quest to have it all will cause her to lose everything that matters. A tale of love, trials, and faith set against a wonderfully drawn portrait of San Francisco, Consider LIly is a hilarious look at life as a modern Christian. And now, make way for Anne and May! Technically, CONSIDER LILY was born over beers at McGee's, the terrible Irish pub where we met every week for "writing group" last year. But the seeds for this book were actually sown many years earlier. You see, like many women, we used to believe that we didn't measure up. I won't go into the many reasons I thought I was destined to be friends with the Elephant Man for the first twenty two years of my life. Let's just say my perm didn't help, and neither did my braces, my bangs, my acne, and my utter lack of fashion sense. I think in my heart I knew I shouldn't have these feelings, but it didn't make a difference. I was still cripplingly self-conscious. As a child, I was so withdrawn that I had to establish a "secret ring" for when my parents called and I was home alone. They'd ring twice. Hang up. And then call back. Only then would I answer the phone. On top of my shyness, I couldn't make sense of fashion either. 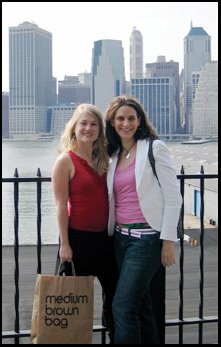 I was constantly mocked about my hilarious ensembles (let's not even discuss the exclusively silk wardrobe I tried out in ninth grade). Needless to say, I felt like some kind of leprosy victim walking the halls of my school. Unclean! Unclean! Social leper coming through. But the thing is neither of us were actually ugly. We just believed we were because we didn't look like the women in the fashion magazines. We had freckles, scrunchies, frizzy hair, and amorphous bodies. Only through many years of seeking God and knowing that he loved us, did we begin to feel more "normal." And that's where this book really started—in the slow recognition and firm belief that we are beautiful—that we are all beautiful—because God made us, and everything he made is good. 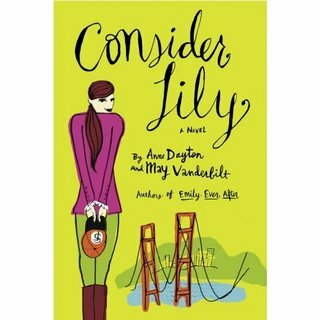 CONSIDER LILY was a blast to write, and we hope it's fun to read. But we also hope that it makes women think about how God sees us and to delight in that. We hope you enjoy the read and please feel free to write us your thoughts about it. We love hearing from you guys! Ecclesiastes 3:11--He has made everything beautiful in its time. Camy here: Thanks, Anne and May! You guys rock! I know I’ll totally relate to Lily.